The 2016 Eurovision Song Contest was held in Stockholm. Here you can find all the news about Stockholm 2016. From winner Jamala to Sergey Lazarev and Australia’s Dami Im. At the end of this year, we look back at the class of 2016 of the Eurovision Song Contest one more time. What have they been up to after the contest in Stockholm? Listen to new songs from Sergey Lazarev, Frans, Minus One and others! At the end of this year, we look back at the class of 2016 of the Eurovision Song Contest one more time. What have they been up to after the contest in Stockholm? Listen to new songs from Dami Im, Amir, Michal Szpak and others! At the end of this year, we look back at the class of 2016 of the Eurovision Song Contest one more time. What have they been up to after the contest in Stockholm? Listen to new songs from Jamala, Barei, Douwe Bob and others! The Eurovision Song Contest has won a Rose d’Or Award in the TV Entertainment Category. The contest of 2016 was honoured during the 55th edition of the awards in Berlin. The song ‘Love Love Peace Peace’, performed by Måns Zelmerlöw and Petra Mede as interval act in the final of Eurovision 2016, has been received well by the viewing audience. It will now get a studio release in due time, confirmed composer Edward af Sillén. It is time for the final episode of The Aftermath. And of course, we have a look at Ukraine, the winner of the Eurovision Song Contest 2016 and the reactions that followed on Jamala’s victory. The the Aftermath we look back at the Eurovision Song Contest 2016 one more time. Today we focus on our own Australia, that got so close to victory in Stockholm. The most angry nation, in recent years, in the Eurovision aftermath is perhaps Spain. Every year, expectations are high amongst the Spanish fans. But almost every year, the final result is a big disappointment. 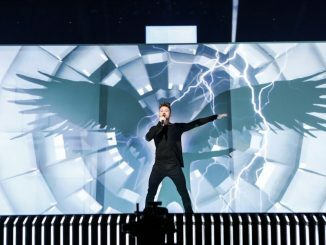 In the Aftermath, we take a look at the outcome of the Eurovision Song Contest 2016 one more time. In this episode we talk about Russia, the big favourite to win the contest, that ended up in third place.